Quoting myself, very late on Friday night. One of the handful of pictures I took before things got crazy on Friday. Where do I even begin the account of our sail on Friday? We left Newport at 5 am. It was cold and dark. It got windy as the sun came up. Then it got windier, and windier. By the mid-afternoon we were cruising along at 7.5 knots or so with a triple reefed main and our solent. The wind was still increasing and the waves were sizable. Pirat was cascading down one and into the next with water crashing over the boat and our anchor thrashing in the bow roller. The wind continued increasing so we decided to reef the solent. I kind of lost it at this point and Lee took control, making the decision to heave-to, collect ourselves, and then tie in the reef. We accomplished that, then hove-to again so Lee could get the reef ties in the rest of the solent, securing the baggy foot of the reefed sail. We got Pirat back on course but it wasn’t long before even the triple reefed main and reefed solent seemed like too much. The wind was gusting above 30 knots and the waves were getting HUGE! I didn’t know what to do, which freaked me out. Lee was equally befuddled. Should we take down the main or the solent? Should we put up the storm jib? We were about to take down the solent when I decided the main should be the one to go. That was east to take down, since most of it was reefed away already. As the sun began to set, I cowered on the floor of the cockpit and Lee stood at the helm with a worried expression on his face. Every other gargantuan wave seemed to thrown Pirat up, down, and sideways. Gust-wave combinations conspired to bring the boat farther over on her side as the rigging howled and the rudder squeaked (yes, the rudder squeaks). We were heading into the farthest offshore part of our passage, the part where the coast makes kind of an elbow at NY city. It seemed like the waves and wind were only going to get more extreme as we got farther from land and a night of fear and uncertainty lay ahead. Pirat still felt overpowered with the reefed solent. We didn’t know what sail combination would be right and we were feeling timid about making a headsail change to the storm jib in the dark with the vicious waves. It was time to make a decision. 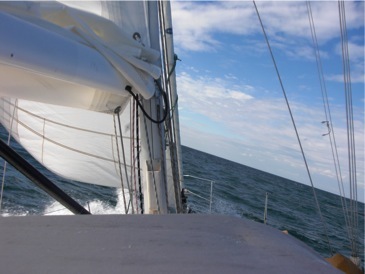 Lee figured our options were to keep going or tack and head for the coast of Long Island, about 20 miles away. We’d be sailing all night and most of the next day if we kept heading for Cape May. Most of that night would be spent 30 miles or so off shore. With the wind and waves building beyond what was forecast, we were overwhelmed. Or, as Lee said at one point, “over-our-headed”. We tacked. Tacking did not improve the conditions at all but at least we were heading towards relief. I opted to cower down below for a while and Lee joined me eventually, seeking relief from the relentless cascades of water. Luckily, we can use the AIS on our new VHF radio to keep an eye on any approaching boats down below. the AIS had already helped us avoid some big ships earlier in the day and it made staying below decks possible in the rough weather. Lee popped his head up once in a while to see if there was anything to see. It wasn’t long before something else happened. All of a sudden, I heard a loud whirring sound prevail over the howling wind, slapping rigging, and creaking boat. “What’s that sound? Is that the wind generator?” I said. Lee opened the hatch, now completely sealed to guard against waves finding their way down below. The sound instantly got 10 times louder. It was the wind generator. It had gone into Spinning Wheel of Death mode because of too much wind. The motor that provides resistance, generating energy and keeping the generator spinning at a reasonable speed, had shut off. Lee tried to brake the Death Spin with the wiring down below but that didn’t work. 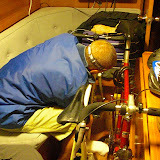 He thought maybe the connection on deck had just come loose so he donned his bike helmet and went up to check. Why the bike helmet? When the generator enters Spinning Wheel of Death mode it reaches speeds high enough to put a dangerous amount of force on the blades, potentially causing them to shoot off at whatever is in their path, be that boat or human. As funny as Lee looked in his red foul weather gear suit and bike helmet, I couldn’t laugh. I was scared to death that he’d be injured on deck. He made it back and the connection was fine. He wanted to go grab the generator’s tail with the boat hook and lasso the thing but I wouldn’t let him. That seemed like a good way to get decapitated. We both resigned ourselves to spending the next few hours down below, hiding from the wind generator. We were afraid to go on deck to do anything with the sails, even though the wind was increasing rather than decreasing. We ate some trail mix and pita bread. I couldn’t keep my eyes open. Maybe it was the exhausting day thursday (more on that at some point) and the 4am morning and maybe it was the hours of shear terror taking their toll. I laid down on the lee bunk and fell asleep instantly. Lee monitored things for the next hour and a half as Pirat careened towards Long Island. I awoke when we were a few miles off and reluctantly got ready to go back on deck. We formulated a plan: 2 miles out, start the engine, take down the solent, motor into a gap between two fish trap areas shown on the chart. Anchor in about 25 feet of water, just off the beach. We had also been considering an inlet nearby but it looked sketchy and we weren’t able to point to it sailing upwind towards the shore so that option was out. Heaving-to just offshore was also an option, but anchoring seemed like a better choice. Anchoring is something we can do well. Lee and I executed the plan. The wind had decreased to 20-25 knots and the waves were insignificant compared to their offshore brethren. Still, anchoring was quite a challenge and Lee pulled it off masterfully. All we could see onshore were lights, from houses we assumed. Lee went after the wind generator with his helmet on again. He hooked it, turned it around to stop the spin, and tied it up with w sail tie. We monitored our anchoring job to make sure the boat was holding but were in our bunks at midnight. Lee and his nemesis the day after their battle. I slept. I don’t think Lee did much. In any case, things much better in the morning, although we felt rather stunned and defeated. We sat around talking about what we should have done and what we would do now. After getting a taste of real, serious sailing we were having second thoughts about our plan. At the hight of the chaos the night before we’d vowed we’d give it all up if we could instantly end what was going on then. The “get me out of here now!” feeling took over. In the morning, we were out of the scariness but felt like we’d had a close call and barely made it out. 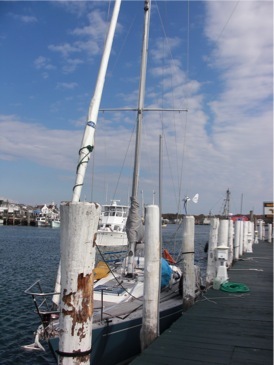 We motored up the coast of Long Island, since were were closer to the North end, and docked in Montauk for the night. The harbor was depressing but we got Pirat washed off and all evidence of the previous night’s wreckage erased. 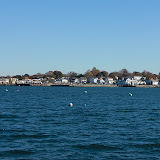 Yesterday we left Montauk for Stonington, CT back on the mainland. We almost couldn’t get off the dock, actually. The wind was holding us onto it from directly abeam and no amount of reverse or forward, even against a dock line, would get us off. Lee pulled out the throwing anchor, heaved it off the bow, and it held after a few tries. He managed to pull the bow far enough away from the dock (while I moved fenders around on the stern) that I could drive off in forward. Yay throwing anchor! Pirat, all clean but pinned to the dock in Montauk. The sail was a short 16 miles but the wind cranked from around 20-30 knots. We did a little experiment: starting with the storm jib, finding out we couldn’t point (duh), adding the double reefed main, and then eventually going down to 3 reefs. The storm jib rocked! It was so tiny but we moved along at 6-7 knots close hauled. We pulled into Stonington and anchored at sunset. This morning we motored down the Connecticut coast a few miles to Mystic, where we weaseled up the river, through a couple bridges that had to open for us, and past the Mystic Seaport historical village. We anchored in the designated spot after a bit of maneuvering in the tight, shallow quarters. It was ridiculously cold the whole time – below freezing with the wind chill, I’d guess. Here it is, our first video! I took this yesterday as we beat over to Stonington. Now we’re cozied up in a cafe in Mystic, guzzling the internet. After reflecting on Friday night for a couple days we’ve come up with a new philosophy, revised approach to the sail south, and some rules to follow. – Don’t get cocky – stay cautious for a reason – take it slow. – No more over-nights for a while – we’re going down Long Island sound, offshore around NJ cause we have to and outside the Chesapeake cause it’s not that far and inside would take way too long. Then we’re probably taking the ICW inside Hatteras (no desire to conquer the cape right now). We’re probably hit up the ICW as much as we can going south and just take things one day at a time when we need to. At least once we get down there it will be warm. – Lee is also working on getting a drogue, which would act as an emergency brake at sea in drastic situations. 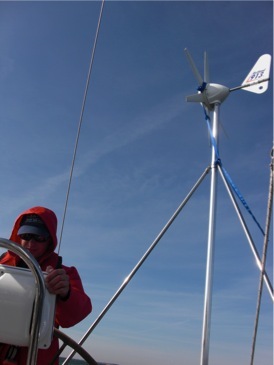 – When we’re thinking of reefing the solent, just go to the storm jib. The solent is still a big sail and Pirat is sensitive to headsail size. – Remove all bedding and mattresses form forward bunk when sailing in serious stuff so we can shove a headsail down there if we need to change. Tomorrow we’re heading south again, maybe to Stratford or somewhere between here and there. This feels somewhat like our trip down the sound last spring only we’re much, much more seasoned than we were then.